Putting a price on carbon, based on the polluter pays principle, has the potential to be a powerful policy tool to reduce greenhouse gas emissions in the fight against climate change. A carbon price can come in the form of a tax or a cap and trade system. With a tax, the price of polluting stays constant, while a cap and trade system allows prices to fluctuate based on emissions. Around the world, more and more governments are implementing various forms of carbon pricing, but so far most prices languish below USD10. While it is impossible to put an accurate price tag on all the damage that climate change causes including biodiversity loss, ocean acidification, sea level rise, drought, famine, spread of tropical diseases, extreme weather events, political instability as well as other yet unforeseen effects, the High-Level Commission on Carbon Prices found that a price of at least USD40-80/tCO2 by 2020 and USD50-100/tCO2 by 2030 is needed to achieve the Paris climate goals. To maximize the effectiveness of carbon pricing, there are however also other issues to consider beyond the price level. Implementing a carbon price should be done as part of a portfolio of measures to address various barriers such as split incentives or high cost measures that are likely not overcome with a carbon price. Further, in the case of a cap and trade system, a minimum auction price is important to avoid the so called “waterbed effect” that can greatly undermine prices and the effectiveness of the system. Other counterproductive policy measures need to be avoided and abolished in order to not undermine the effectiveness of carbon pricing. These include fossil fuel subsidies, free allocation of emission permits, tax exemptions, rebates, and the use of carbon offsets. In addition to fighting climate change, carbon pricing can offer significant co-benefits including reducing other air pollutants, generating revenues for climate measures and a just transition, fighting energy poverty or to reduce other taxes. Wise reinvestment of revenues can lead to a double dividend of economic growth. 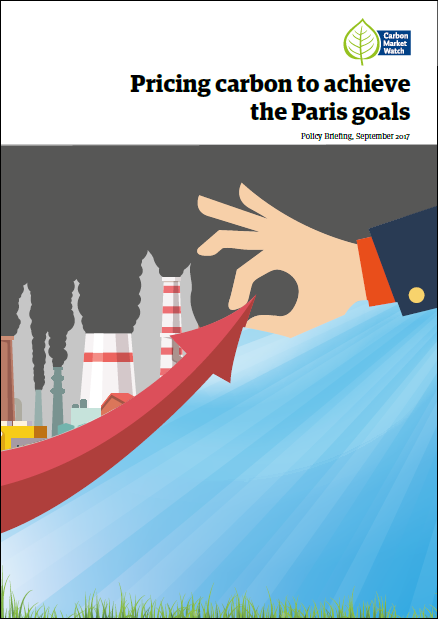 The design of effective carbon pricing policies need broad support from civil society. Environmental Non-Governmental Organizations (NGOs) and other civil society groups play an important role in robust climate policy as a vital counterweight to the interests of emitting industries. To achieve a long term rising carbon price, policy making should not be a complicated elitist project, but should be informed by input from civil society.